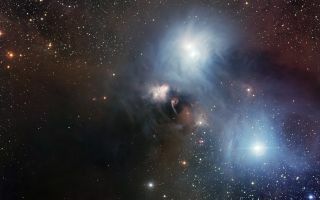 The nearby star-forming region around the star R Coronae Australis imaged by the Wide Field Imager (WFI) on the MPG/ESO 2.2-metre telescope at ESO’s La Silla Observatory in Chile. This amazing space wallpaper reveals nearby star-forming region around the star R Coronae Australis imaged by the Wide Field Imager (WFI) on the MPG/ESO 2.2-metre telescope at ESO’s La Silla Observatory in Chile. This picture, which covers a field of 33.7 x 31.9 arcminutes (about the diameter of the full Moon), is a combination of twelve CCD frames, 67 megapixels each, taken through B, V and R filters, with four exposures of five minutes each.